If you mention NECA on Todd McFarlane's Spawn.com forums, your post will likely vanish. I don't know if NECA has an official forum, but they do have a Facebook page. Log on there to find out such interesting facts as what NECA stands for. Just don't mention Spawn! Actually I don't think they mind. You can mention whatever company you like on the Toy Sale Boat forums. Today we're talking about the NECA sale at Entertainment Earth. For a limited time, EE has slashed 20-percent off over 150 different NECA collectibles. You can browse the entire listing here. I chose to spotlight Gizmo, because as I've mentioned before, I'm a big Gremlins fan and NECA has done a wonderful job bringing Gizmo to life. For so long there were no good Gizmo toys. I bought a puppet from the Hallmark store around the time Gremlins 2: The New Batch was released. 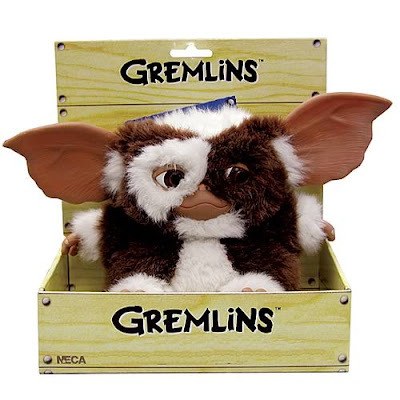 It was probably the best looking Gizmo doll at that time, but everything NECA has made just blows that puppet out of the water. Not that I would advise getting your Mogwai wet.